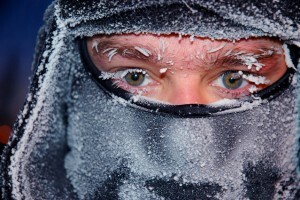 This guy needs a space heater! It’s getting chilly, the furnace keeps turning on, and your propane keeps running out. You can’t seem to keep your place warm enough and you are getting tired of refilling the propane. We had this same problem until we discovered the world of portable space heaters. These aren’t the space heaters from years ago that were prone to catching something on fire or filling the house with carbon monoxide. These new space heaters are efficient, quiet, and work wonders at keeping your living space cozy and warm. There are a few different types, each with their own strengths, but most space heaters made today are extremely safe and efficient. We scoured online forums, guides, and review sites to come up with this list of the 10 best portable space heaters. The two main categories of space heaters are radiant and convection. Convection heaters work by heating and circulating the air in a room. They are very good at quickly bringing a room up to a comfortable temperature. Most models include fans to help circulate the air. Convection-type heaters include ceramic and electric coil models. Radiant heaters work by reflecting heat to warm up the objects around them. They are ideal for producing long, slow heat to maintain the temperature in a room. They work best when you sit close to them, so they can radiate the heat on you. Radiant heater types include infrared, oil-filled, and propane heaters. These types of heaters are best for spaces where people are moving around and need the entire space to be heated. Ceramic heaters are a newer type of convection heater. They are designed to heat the air and circulate it around the room. They can heat a whole room more quickly than infrared-style radiant heaters and typically use less energy to bring a room up to the desired temperature, but they require more energy to maintain that temperature once reached. 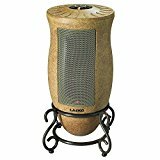 This ceramic tower heater is Amazon’s #1 best selling heater. As a ceramic heater, it is designed to quickly heat an entire room by circulating warm air. This model features back-and-forth oscillation, a 24-hour programmable timer, and a programmable digital thermostat. It is just perfect for putting in the corner and heating up a room. Reviewers have said this heater will easily heat the living space of an RV or any other 200-300 square foot space, even those with little insulation. Another plus for this model is it is extremely quiet. This small portable ceramic space heater has both a 1500 watt and 900 watt setting, along with a fan-only option. The fan is very quiet, blowing warm air to keep you comfortable. It is just right for heating a small bedroom or other small space. It is portable enough you can move it around with you or set it on a shelf or table to point in the right direction. This designer ceramic heater is similar to Lasko’s oscillating tower model, but with a more elegant and decorative look. These types of heaters are best for bedrooms or sitting rooms where you are staying in a relatively consistent spot near the heater, rather than moving around the room a lot. Infrared heaters fall in the radiant heater category and are known for producing a very mild, very consistent heat. They don’t get extremely hot to the touch, so are very safe to use. They are also very quiet, working silently in the background to keep you nice and cozy. Infrared heaters are radiant heaters, which are designed to heat the objects close around them, including you, rather than heating the air. This 1500 watt infrared space heater is designed to heat a space up to 1,000 square feet, although in practice most users have reported it is better for about 300 square feed, perfectly sized for RVs or single rooms. It has high and low temperature settings that range from 50 to 85 degrees. With the infrared heating technology, this heater provides 60% more heat than other 1500 watt heaters, helping bring your living space up to a cozy temperature faster. This infrared quartz fireplace provides warmth for a large room. Like other portable electric heaters, it uses up to 1500 watts and can be plugged into a standard 15-amp household electrical outlet. Reviewers have said it can realistically handle heating up a room 300-500 square feet, but others have had success heating an apartment up to 1500 square feet. The flames are very realistic and can be turned on with or without the heat. This model also features a blower fan to help circulate warm air around the room if desired. The dimensions are 22.5″ H x 28.5″ W x 11.75″ D and it weighs around 60 pounds. This would be a good heater for a large 5th wheel or toyhauler, or heating a typical sized living room in a house. Oil-filled portable heaters are best for maintaining a steady heat in a mid-sized enclosed room without using much energy. Oil filled space heaters are known for being absolutely silent and holding a steady temperature. They are permanently filled with oil or water, which maintains a smooth even temperature, making them very efficient. Many people like oil-filled heaters because they don’t dry out the air like some convection heaters. They take longer to bring a room up to temperature, but are the best at maintaining a steady temperature throughout the whole room once reached. The DeLonghi portable oil-filled heater is approximately 2 feet tall, 1 foot wide, and 6 inches deep. It includes roller wheels to make it easy to move around. Reviewers have said it provides good steady heat during cold days and nights and is perfect for spaces up to 20×20 feet. 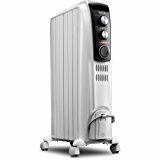 This DeLonghi TRN0812T portable oil-filled radiator heater is a smaller alternative to the DeLonghi Safeheat. It is approximately 15 inches tall and 18 inches wide. Reviewers have reported it can easily heat up a smaller room, such as a small home office, bathroom, or an RV living space. Micathermic or mica panel space heaters are a newer technology for radiating heat. They use a combination of convection and reflective radiant heat to provide the best of both worlds. The heating panels are made from the mineral mica, which has the properties of heat stability and resistance to breakdown. The advantage of this type of heater is they are very quiet, much like oil-filled heaters, but heat up much more quickly, bring the temperature in a room up faster. These heaters are typically very thin and are suitable for wall mounting. The DeLonghi HCX9115E is the top pick of these new mica panel heaters. Designed to produce quick radiant heat, this heater will quickly warm a room and maintain a steady temperature. It can be mounted on a wall for a more modern look or to save space. It is cool to the touch on the back side, while still providing adequate heat radiation on the front. Propane space heaters are great for camping, power outages, or any other situations where you don’t have easy access to power. These newer models are safe for indoor or outdoor use. The safety features include automatic shutoff if the heater is tipped over or picked up, or if the oxygen is low. They use 1-lb portable propane bottles, but can be fitted with an adapter to use larger 20-lb tanks. Propane heaters are no longer outdoor-only! This portable indoor-safe propane heater provides radiant heat for up to 200 square feet. It will automatically shut off if tipped over or if it detects low oxygen levels. This model uses a standard 1-lb propane tank (the green kind you take camping). It is perfect for heating an RV or home when the power is out or when you don’t have electrical hookups. This Mr. Heater is the big brother of the smaller MH9BX model. This one produces twice the BTUs of the smaller model and is recommended for 400 square foot spaces. Which one is the least expensive to run all night? I would say the oil-filled are probably the least expensive if you leave it on all night. They are great for maintaining the temperature of a room, but take a long time to heat it up if it starts out cold. So if you want to turn it on at night to maintain the temperature in a room, the oil-filled style is probably the best and most cost effective. I’ve been using a ceramic oscillating space heater like #1 on your list. It works well in the kids room at night so they don’t get cold, but then we don’t have to heat the whole house just to keep their room warm. We set it to 68 degrees and it turns off and on automatically to keep the temperature at that setting.